Just yesterday, my husband and I took the same pen and held it together in both our right hands and did something we’ve been wanting to do for a very long time. We crossed “Kitchen” off our list. We have loved watching the progress of this room, as we worked on project after project – but it seemed to take an eternity. We had disciplined ourselves so we couldn’t move on to other things we hoped to do, until the kitchen was done. A year and a half later – as time, money, health, and babies would allow – it is now complete. You may have seen the previous “almost finished” reveal, HERE. 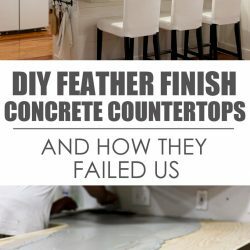 Or you may have read HERE when I talked about how our DIY concrete countertops had to go. But today . . . today I am showing you the kitchen that is finished. The kitchen we have finally perfected. The kitchen that was in my dreams from the get-go. 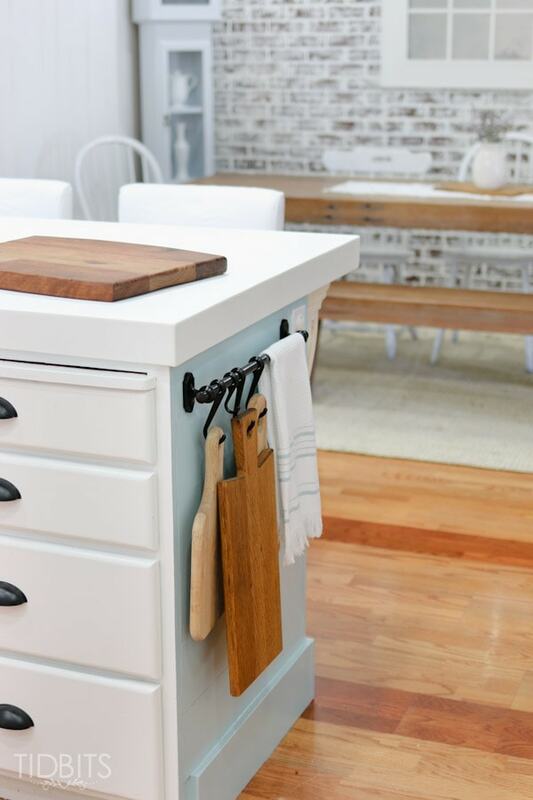 The finished white kitchen, with touches of wood tones and splashes of blue. The finished kitchen where there is a place for everything, and everything is in its place. 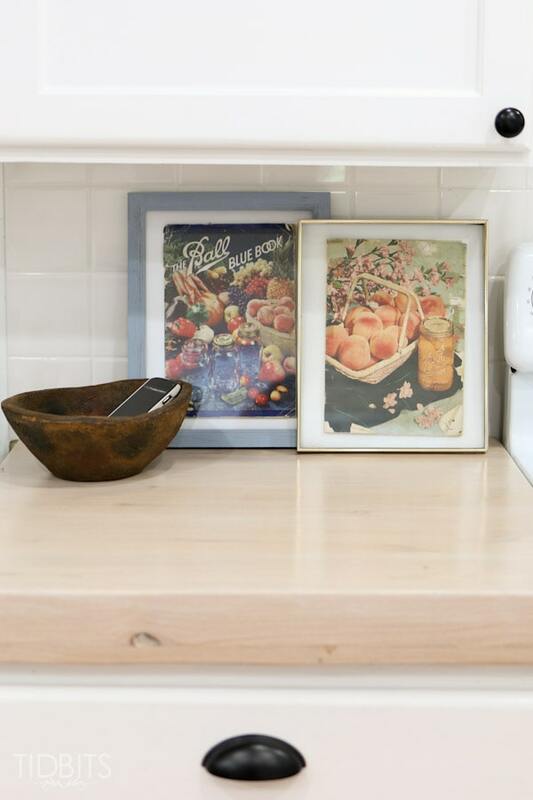 The kitchen that just makes me smile every time I walk in it – even if just to do the dishes. If you have followed along, and read the last reveal, HERE – I would like to address the things that we’ve changed or added to bring it all together. Some of them were minor changes and some of them were pretty major. Forgive me if you feel you have seen some of these same images before but I wanted to be sure a complete update was available. Also, if there are details you feel I am missing or if you would like to know more, try reading my last reveal which is full of details. If you have any other questions, feel free to contact me. Real quick, lets take a look at the before, during, and after. 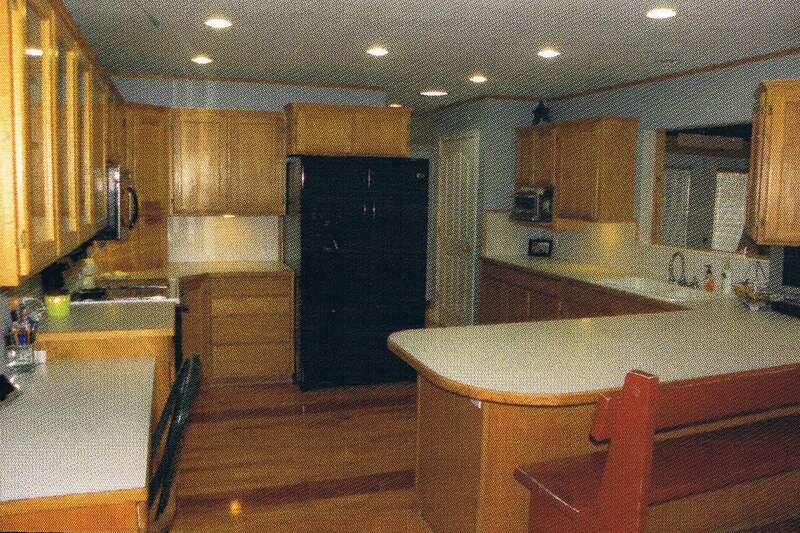 This is the “before”, or how the kitchen looked when we bought the house. Then we have the “almost finished” version, where we were exploring our countertop options and wrapping up details. And finally, with some hard work from the hubs and his DIY super-skills, and me and my paintbrush . . .
. . . Our kitchen today. The biggest change from the pictures, was with the countertops. After it became evident that we would need more reliable/permanent tops, we explored our options and what we could afford. My ideal “in a perfect world” countertops were either white granite/marble with gray swirls or the corian/solid surface version of white with gray swirls. Neither were in our price range or ability. But we did discover some white wholesale corian/solid surface slabs that could be purchased – minus any labor – for a fraction of the price. My talented man mustered the courage and decided that he could learn to make and install corian countertops all by himself – if it was the last thing he would do. And I must say – he rocked it. They are absolutely beautiful and he did such a good job. 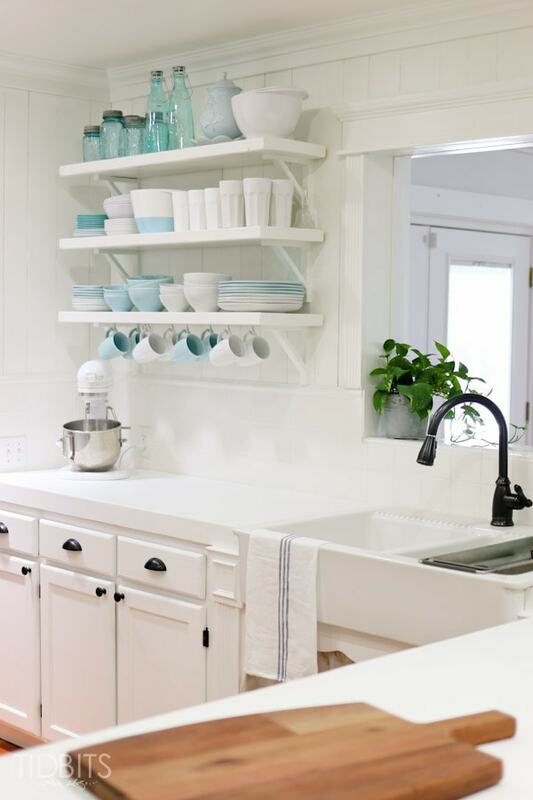 There is so much more to say about this DIY countertop, and I have tips and pictures for you if you think you would like to learn yourself – so go HERE to read my post on DIY Solid Surface/Corian Countertops, if you are interested. Once the new tops were on, I just couldn’t help but think it was too much white. I know. Is there even such a thing? I really didn’t think there could be, but I couldn’t repress the nagging feeling to add some color. So in a spur of the moment trip to the paint store, I searched for a blue with a subtle green/gray and found “Soft Chinchilla” by Benjamin Moore. 20 Dollars and a half hour later, I was having a nervous breakdown from all the color. I don’t usually go that bold. It only took a week for my eyes to adjust, and I came to the realization that I absolutely adored this color in my kitchen, and it was just what it needed. 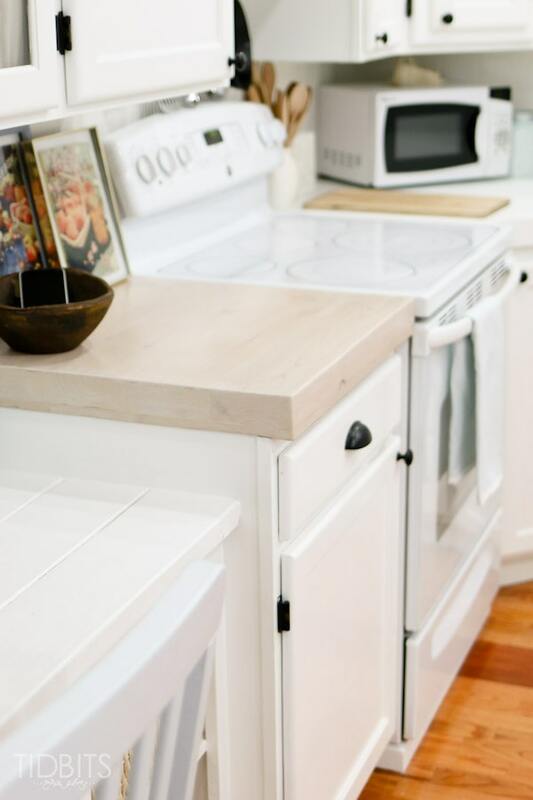 All of a sudden, the kitchen felt like it was coming together perfectly for that coastal cottage + hint of French farmhouse look that I was hoping for. All I needed now, was some big chunky corbels (from Home Depot), white washed with white wood stain. (P.S. Have you ever used this white wash pickling stain? (affiliate link) It’s amazing! I can see it being well used in many future projects). I really love how the color in the peninsula flows with the dishes in the background. I left everything the same on my open shelves the hubs built, because I still love the arrangement. Our bananas are also still caged from the French inspired box I found at Hobby Lobby. I added a couple of houseplants – which is a first for me. Many of my readers had recommended I add them to my spaces. I am pleased to announce that I have managed to keep them alive for 4 weeks, and I am resisting the urge to buy more because of the crazy sense of life they have added to the room. I found this plant at Lowe’s, and it is called a “golden pothos”. Over on this side of the kitchen, my husband (his name is Kevin, by the way) built a butcher block from some wood and I added the same white pickling stain and a top coat. It created the most lovely wood tone and still allowed plenty of wood grain to show through. I framed some very old and very loved canning books passed down from my husbands mother, and added them to this butcher block, as well as a wood bowl to catch my phone and keys. I seriously love the charm these books bring into the kitchen. The office space, blogged about HERE, received a houseplant as well. It is an exotic angel plant variety from Lowe’s. I do still love the entry view (blogged HERE) I get to look at while I work on the computer. I wish I could say it is always this clean, but the papers do seem to get dumped all over this planked top Kevin built. Or shoved in the cupboards which you should be grateful that I covered. Over by the oven, a lot was kept the same. I finally found a platter I loved to stick behind the pans (thank you Hobby Lobby), and I ended up giving the upper baskets a blue/whitewash paint job. The dark contrast of the baskets from before was bothering me. 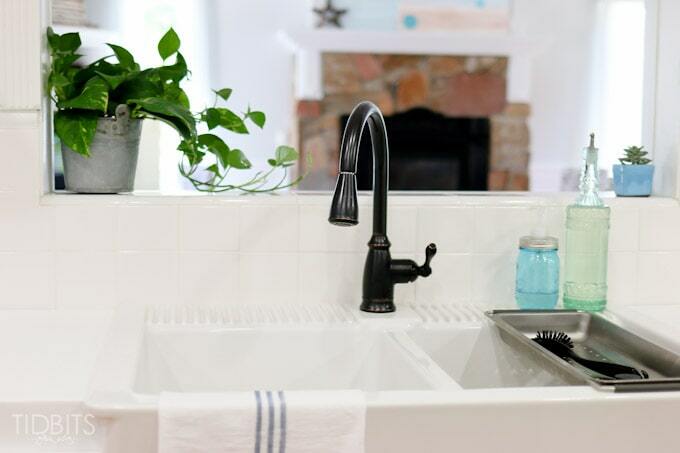 We still love our farmhouse sink from IKEA and the convenience of the skirt. We enjoyed adding fun little details to help the space feel more unique. Kevin added to our cutting board collection when he came into some beautiful old wood, and they are in handy reach of my work area. You might also notice the little glimpse you get into the dining area of the kitchen. I can’t wait to finally reveal the complete dining table Kevin built from old wood from my grandpas junk yard, but this post is really long enough. Stay tuned for the next post on our dining room! I love and appreciate any shares you can send my way, and here is a pinterest friendly image for you to add to your boards. *This post contains affiliate links. Rest assured, I never recommend a product I have not used and loved. **Linking up to these parties, HERE. Best kitchen I have ever seen. You must have a talented husband. Great pictures as well so you must be just as talented. Absolutely stunning, what a great transformation! 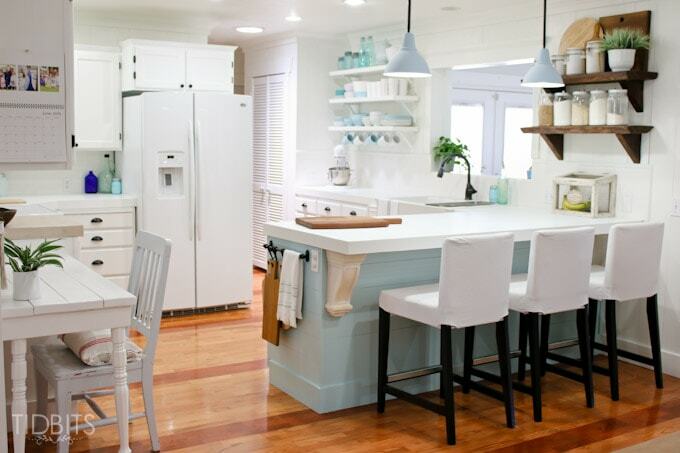 Your kitchen looks so bright and inviting and I love the touches of blue throughout, simply gorgeous!!! Beautiful! And I would check it as complete as well cause it is perfect! Who wouldn’t love to cook, or do dishes, in your kitchen. Truly a happy place. I have a hard time loving to cook or do dishes, but a pretty kitchen helps! Thanks for your sweet comments! 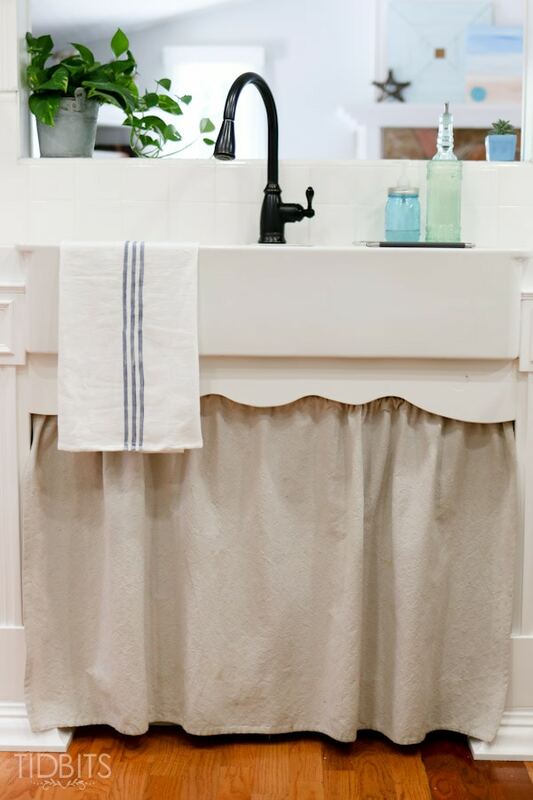 Belinda recently posted…Budget Friendly DIY Master Bath Remodel! Thank you! I’m glad others are liking the color. It made me nervous to slap on, but such a small space I dared to be bold. Thank heavens it worked out. Appreciate you stopping by and taking the time to comment. Your kitchen is absolutely gorgeous Cami!! So pretty and happy and open!! I have had several pothos over the years. They are somewhat hard to kill. I would forget to water mine all the time. Do that too often, and yes you can kill them. Another plant that is a hard to kill/forget to water one, that looks great is a spider plant. They come in some great varietys. 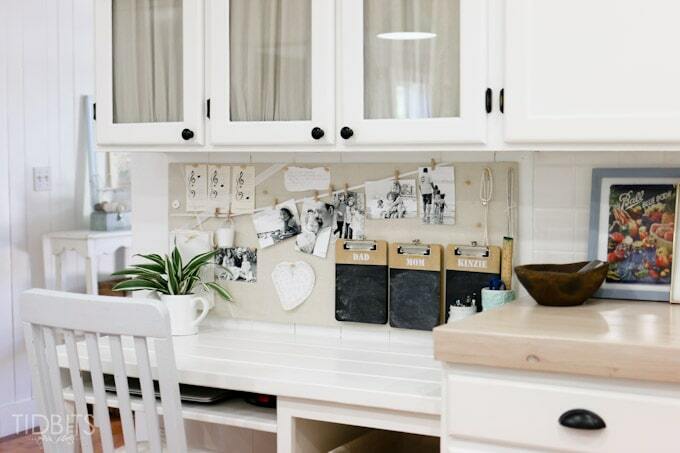 I love what your husband did to your kitchen. How lucky are you? You will have a lovely space for years to come because he is handy. And you did a fabulous job decorating it! This was all so good to know! I haven’t read about house plants or anything and trying my hardest to keep them alive. I’m glad you mentioned not to water them too much – which is what I worry about sometimes. Definitely going to look into spider plants because I have a sudden desire to add them to every room. My hubs told me I have to keep these alive for 3 months before I can buy more. Ha! Thanks for taking the time to comment for me! Makes my day! So beautiful and inspiring. You guys are quite the team! You haven’t seen pictures of my kitchen…It’s too gory for the blog! But I aspire to have one like this some day 🙂 What’s next!? Thank you Margie! You and your hubs do some great stuff as well. Kitchens are super hard to work with. They are major money and time suckers – but I do hope you get to it someday. You’ll rock it! Absolutely gorgeous – so bright and pretty! It’s hard to believe it’s the same kitchen! You rocked it, girl! 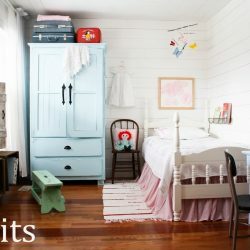 The blue paint is absolutely perfect and really adds dimension and interest to a great design. Pat yourself (and your brave hubby) on the back. Job WELL done. Love love LOVE it!!! And that blue is amazing. It looks so good! Good choice! Tell Kevin he did great too. I will definitely tell him! Thank you so much for always being so sweet Sheri. I’ll work on finding that spare time and we’ll hit your kitchen next. Ha! It is beautiful. Kitchens and bathrooms are the hardest to update and take the longest. There are just so many projects in the one room! Congrats on finishing. We did ours (complete DIY overhaul) 18 months ago and the feeling of being finished is priceless. Good job! It’s all just so lovely, the blue paint on the peninsula bit (it’s really not that bright you know!) is probably my favourite bit. 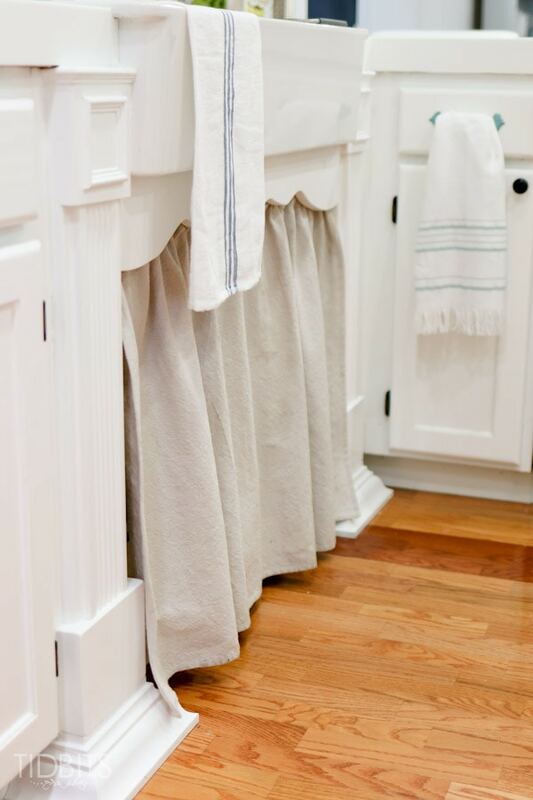 but your hanging rail with the cloth and chopping boards is also a lovely touch. What am I saying – it’s all just beautiful! I can see why you are proud of yourselves-I would be too! LOVE your kitchen and I might be in love! So bright and cheery…love it! Found you at the Link Party Palooza party. 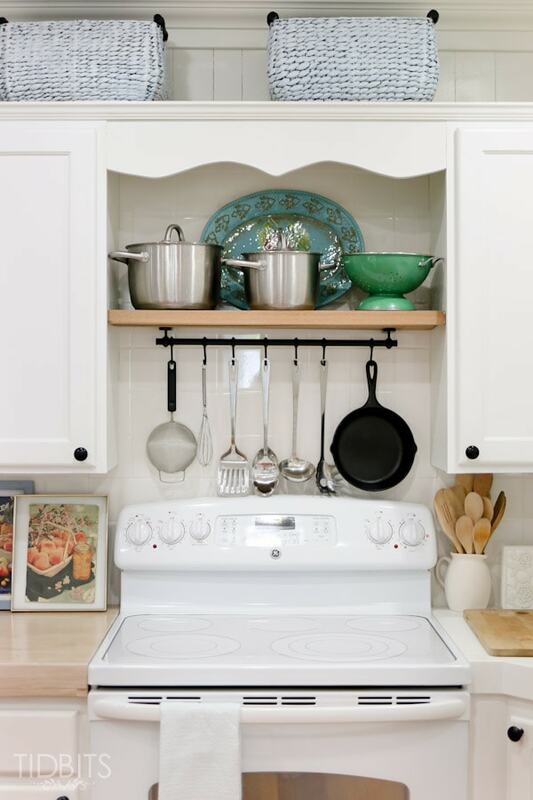 I love, love, LOVE your kitchen! 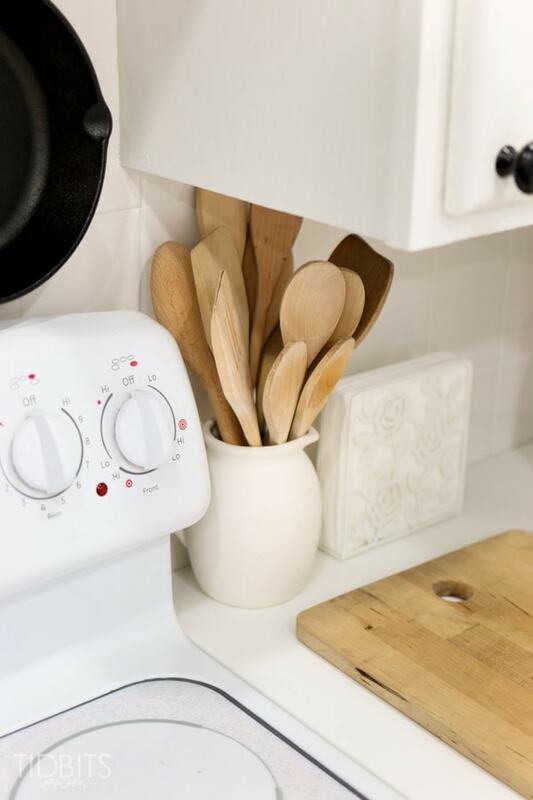 I can’t wait for the blog on how you did the counter tops, I love them and need our kitchen remodeled with counter tops, which we will need to do ourselves. 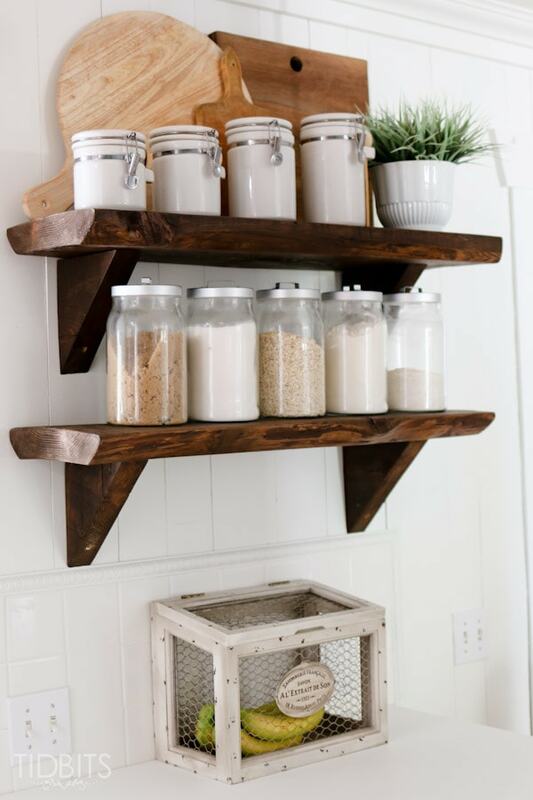 I love the natural wood open shelving!! That blue is also beautiful! This came out fantastic !!!! Quick question… Which counters are these? Friends of ours ordered from the same company and the corian came and it was pretty thin in comparison. I would absolutely tell them these Are the way to go. I just love the thickness of the white!!! Also the open shelves are lovely !!!! Our corian was also very thin, and a total shocker when it came, for me. It is only 1/4 inch thick, or you can order 1/2 inch. You just build your edging to whatever thickness you want and it gives the appearance of super thick tops. The seam is pretty much invisible so it looks great. Thanks for coming by! Love how you completely transformed this room into something bright and cheerful. It is just full of special touches and looks so functional in addition to being pretty. This is my feature at tomorrow’s Your Turn to Shine party. Thanks so much for sharing with us. Thank you so much Jamie! I’m completely blushing over your sweet comments . . . because I pretty much adore everything you do. Your kitchen turned out gorgeous. 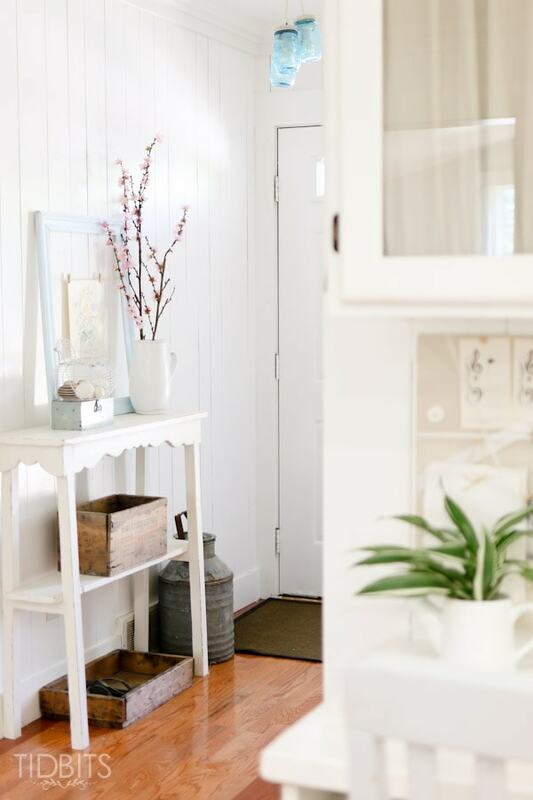 Love the fresh, clean cottage feel to it. 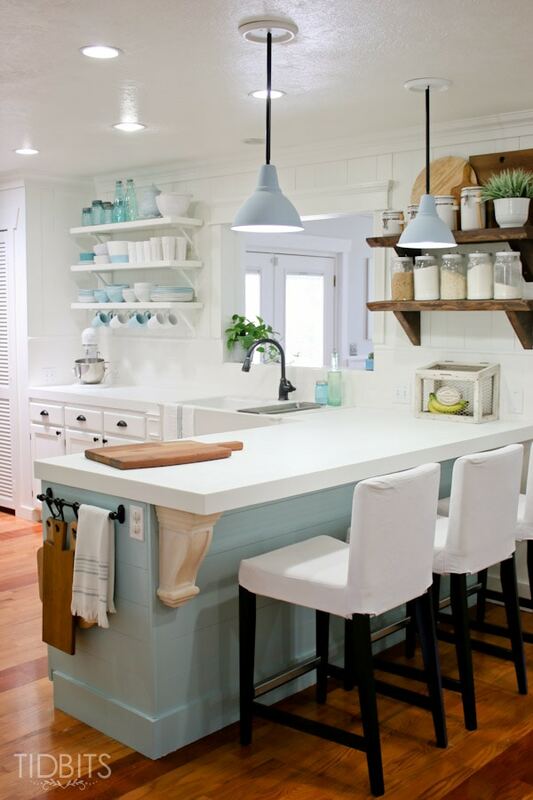 The blue touches combined with all the whites and wood tones is just beautiful. Thank you for your kindness! I do love white, blue and wood, if you couldn’t tell 😉 Glad I could inspire! 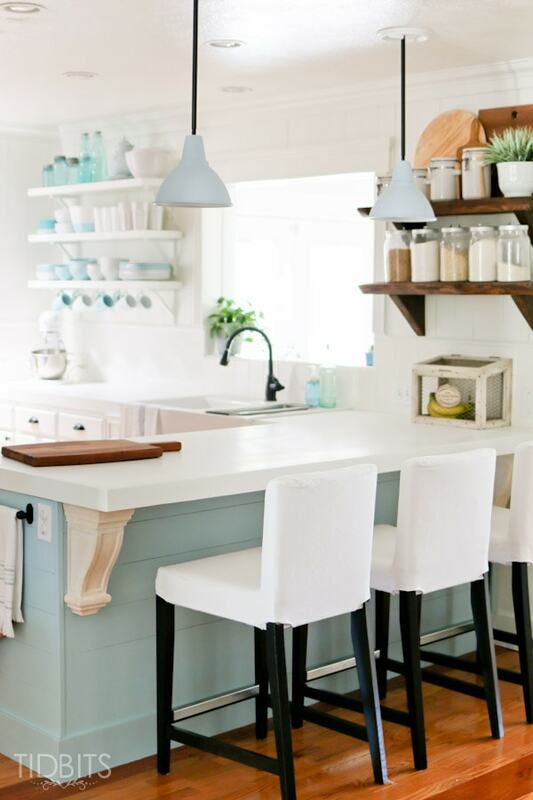 Your kitchen in beautiful and I too love the wood and white with pops of blue (my personal favourite scheme as well.) Great choice with the blue on the pennisula. I have been trying to go turquoise/blue on our pennisula as well but keep wimping out (mostly due to the pinkish ceramic tile that I can’t change right now.) The difference in your before and after is stunning. You guys did an awesome job. Love, love, love the color and you guys did an awesome job! All I can say is wow. Well, okay…a little more. It’s so fabulously beautiful and fresh and bright! I LOVE it! I can’t wait till I get my cabinets painted!!! Wow, what an amazing transformation! My husband and I are saving for the next year and planning a kitchen remodel that I didn’t think would ever happen. We have a peninsula as well and I love the idea of painting it a different color and the outlet on the end (great idea!). 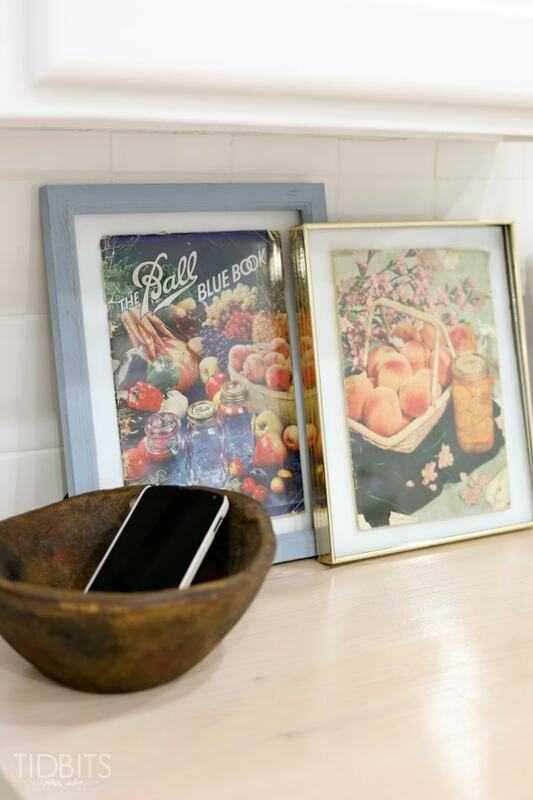 I studied each picture and gleaned so many great ideas from your gorgeous kitchen. Light, bright, and clean! Oh, that makes me so happy that you could take some ideas away from our kitchen. That is exactly why I share! Thank you for commenting for me and making me smile! 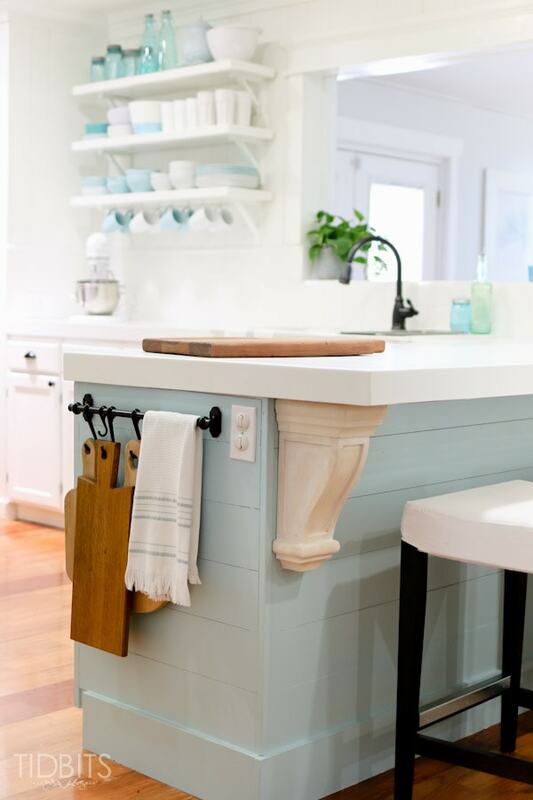 Absolutely beautiful, every single detail from the chunky corbels on the peninsula to the two different type of shelves is perfect! How exciting that you did everything yourself and on a budget, that’s my favorite kind of remodel! 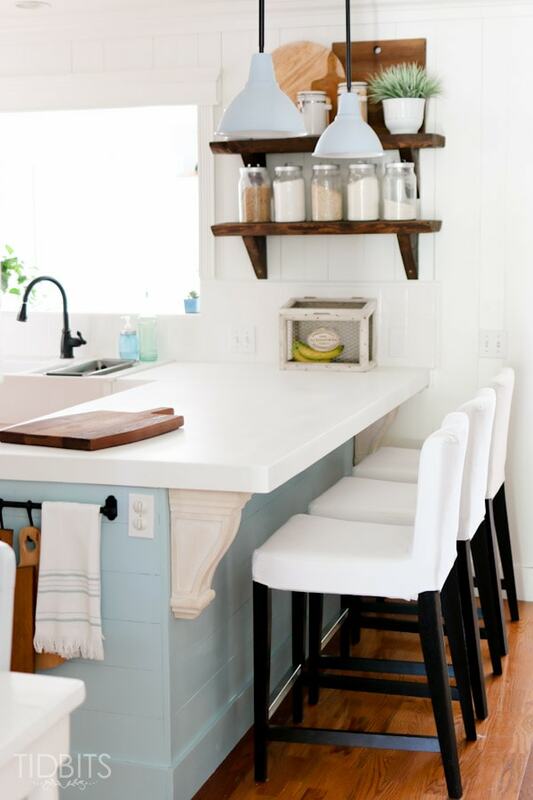 Love the white and adore the blue, you have the perfect balance of each color as well as the warm wood tones. Congratulations! My goodness! What sweet comments you left for me. We DIY because we have to on our budget, but also because we really enjoy it (for the most part). Thank you for stopping by! Your kitchen is beautiful. I totally get you mean about color. I need to just do it! Here in the UK we live in a small bungalow which cried out for very light cool colours. Although in our sixties we like to think our home is modern and bright. 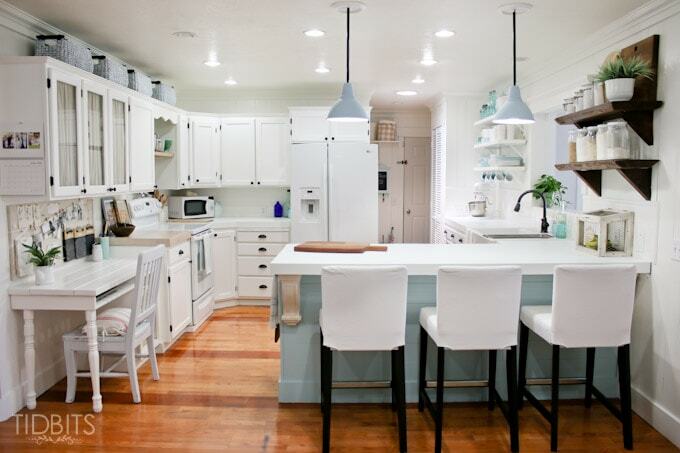 All the rooms are white and pale blue for a cohesive look and your kitchen is my idea of the perfect dream kitchen! Now clever you have been with the little touches. Thank you for inspiring us! What a fantastically beautiful kitchen! You guys did not miss one detail! I would love to share one photo on my cottage kitchen page with a link back to you, if you were okay with that. 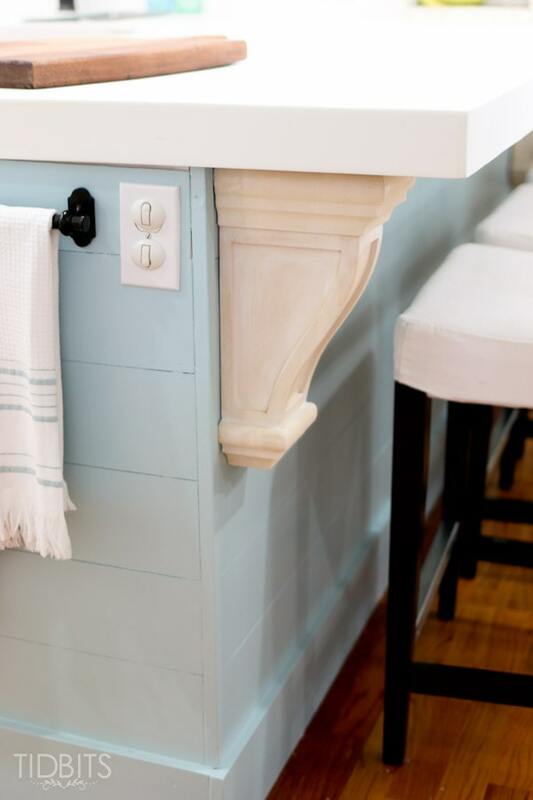 I especially loved the corbels up against the painted cabinet! Bravo! I would love to share my opinion. I really do love this sink. Whenever it appears to be discoloring or staining, I simply add some bleach and dilute it a bit with water and rub it around. It becomes perfectly white again. I’ll admit, I hate to use bleach but it is the only thing that works as good. The only thing I wish they would have done differently is the groves at the top of the sink. They get gross pretty quick and you have to scrub them regularly. The best thing about the sink is the size. I love that I can fit so much inside of it and wash big dishes without a problem. I’ve even bathed kids in there. Overall, I would highly recommend the sink due to the lovely style it adds and its ability to look new with a bit of bleach. Hope that helps! Thank you so much for your inspiration to use blue in the kitchen I myself m in the middle of a kitchen remodel and have been looking for a way to use blue in my kitchen. Instead of an all white kitchen I will be having a wood kitchen with a Blue Island thank you for having the guts to go blue in your kitchen. Just paint right? I imagine I might change it up once in awhile, but I was surprised how going that bold made me very happy. Best of luck to you and thanks for coming by! Do you have any idea at all just how LUCKY you are to have all those AWESOME pieces Kevin has built for your home!?! He is a truly talented furniture builder, not just a DIYer!!! Wonderful kitchen, wonderful home … love the blur … and can’t wait to see the few remaining rooms, Cami! What a sweet comment! Thank you! I thank my Father in Heaven every night for blessing me with such a man. I’m not always the best wife, but I try to always remember to tell him how amazing he is. He just finished our French inspired mantel headboard for our bedroom (coming soon) and I am speechless at how beautiful it turned out. I hope to be able to grow this business to where it can support us if he wanted to venture into a woodworking business. That’s the dream any way. Whoa. Sorry for all that – but yes – I know how lucky I am! Thank you! Absolutely beautiful!! 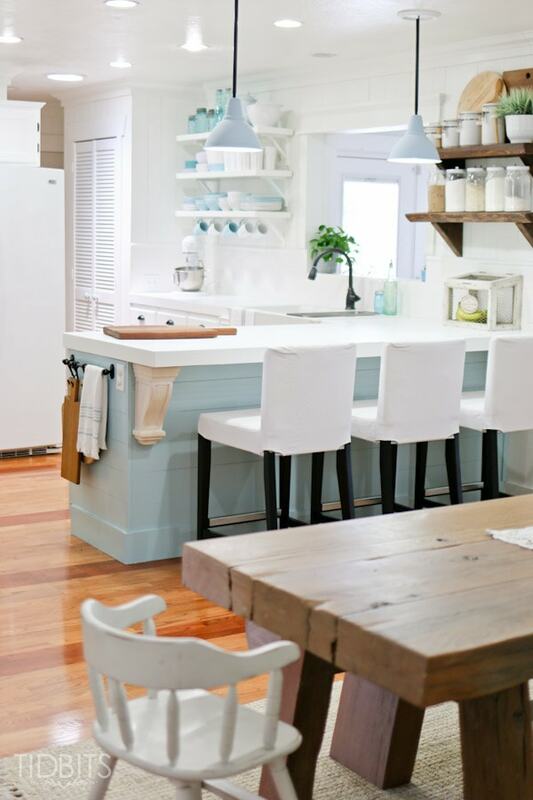 I love everything about this kitchen!! Cami your kitchen is absolutely gorgeous! You had more courage than I did and the White cabinets are so beautiful. I had always wanted white but chickened out at the last minute and went with maple. I tried to tell myself I liked them but I want the white! Good for you. Everything is so Lovely! You and your husband are very talented! Thanks for showing us your kitchen! 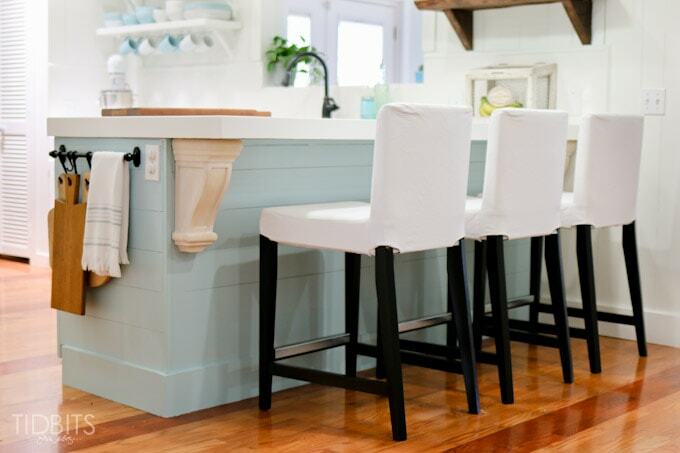 awesome Kitchen…..where did you purchase your counter stools? 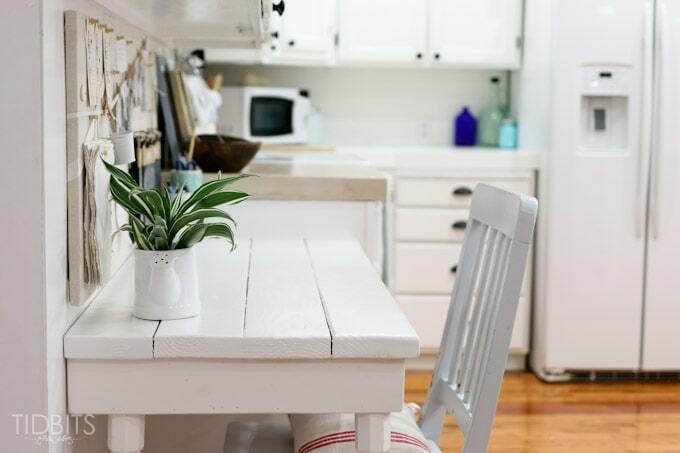 LOVE your entire home and especially the kitchen peninsula! Have been searching and searching for a way to spruce mine up! 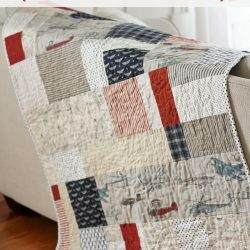 Just found your blog today thanks to Rhoda at http://www.southernhospitality.com What did you use as the “shiplap” for your peninsula?? 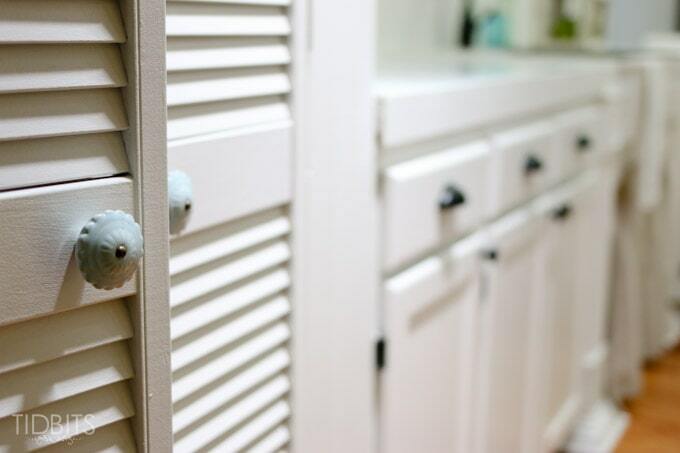 LOVE how you painted it a different color too … would have never even considered doing that until now … after seeing yours, I’m definitely going to try this! THANKS for sharing your awesome ideas! 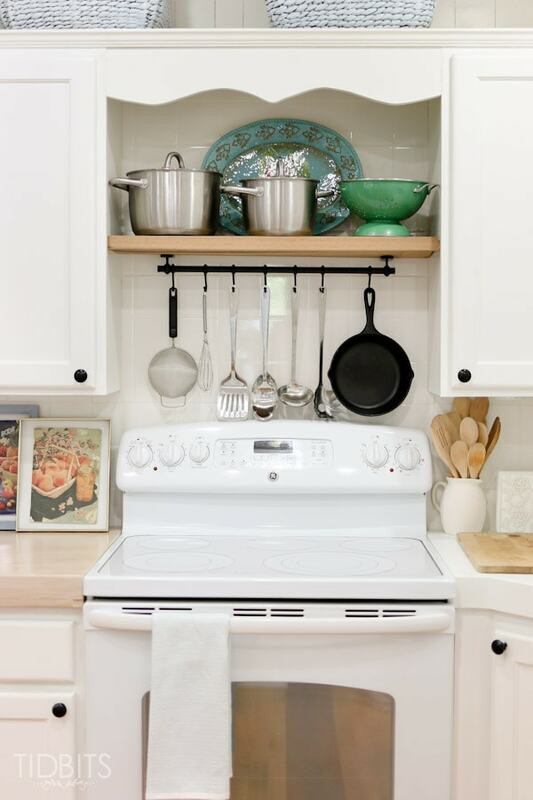 Do you have an exhaust fan above stove? I want to get rid of my old and ugly exhaust fan which would open kitchen to living room. If you don’t have one, does that work for you? I live alone and don’t cook much anyway. I love your kitchen! I found your blog this evening on The Wicker House, and your kitchen is what drew me in. 🙂 I have been eyeing the color “Soft Chinchilla” for a while now in my paint deck, and your peninsula is the first time I’ve seen it used! I love it! Gaw-jus! 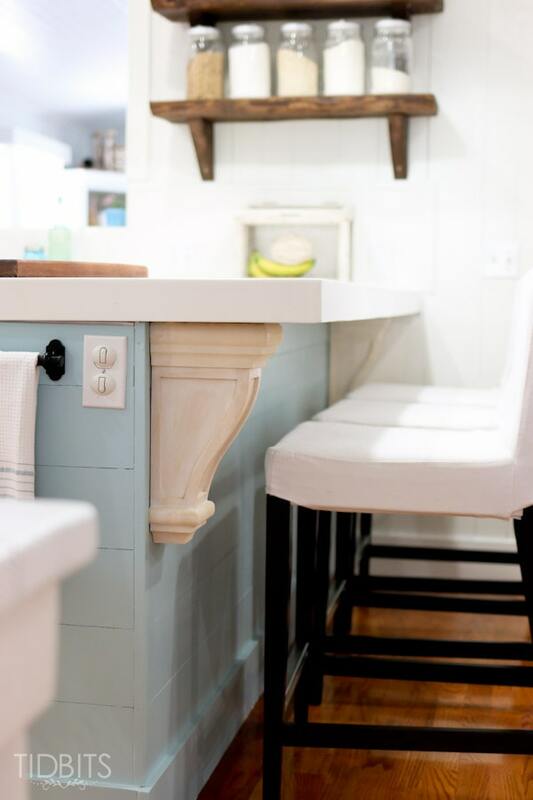 I am renovating a kitchen in an old house, and have been trying to come up with the right island, and I am going to steal your adorable breakfast bar idea. The transformation is amazing. Really beautiful job, you two! So glad I came across this post this morning! First I have to say I love the blue peninsula! And I’m so glad I found this about countertops. I too really want the white, (carrara marble would be amazing!) but to save money thought I would do the concrete, and I see now that I would truly hate the colour! So I will search for other options. Thank you so much for this post! Your welcome! So glad you enjoy the idea. I still love our DIY corian countertops! This kitchen is gorgeous! Where did you get the pendant lights? I love those! Lovely! You did a great job. I have an old kitchen and have thought I’d paint the original birch cupboards. I may have missed it, but is that what you did? Looking at your original kitchen it is hard to believe it is the same place! Your kitchen looks amazing both ways! Great job! I KNOW the kitchen remodel took HARD work, we are going through our second kitchen remodel now. I’m sweating! Lol Love all of your touches. I Love everything and plan to borrow some things to add to my 1970 kitchen work in progress. Like the korbels And hanging the chopping boards. Where can I buy those same dishes. I have looked and can’t find those same ones. Thank you Becky! I found the blue and white dishes from IKEA. Unfortunately, they changed the blue color on a new line and no longer have this beautiful soft blue. So bummed. I have broke a couple and was hoping to replace them. I love everything about your kitchen! I’ll be borrowing more than a few of your ideas in my own kitchen. It’s always a challenge not to over do the white because I love it so much, but I think you have the perfect amount of white with color thrown in. Lovely! Looks so bright. 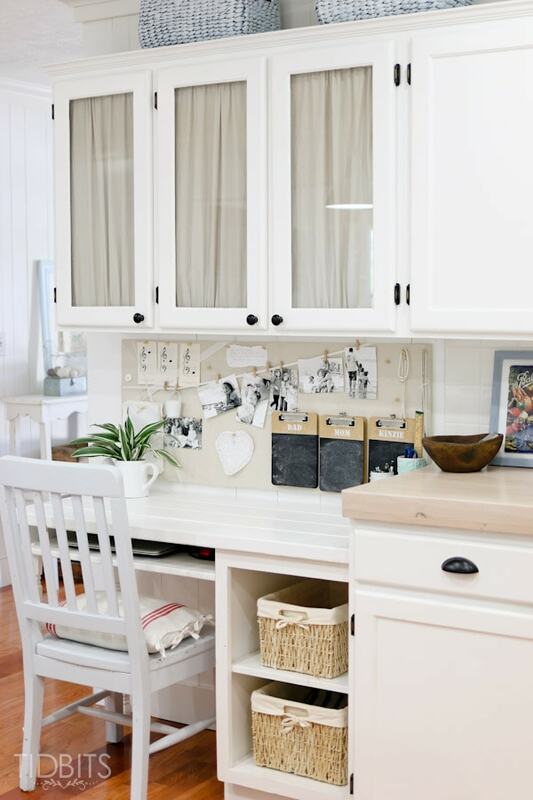 I have those same maple/oak like cabinets—ugh. Please share which bright white paint you used. I’m afraid I missed that (probably distracted with all the pretty photos). Just started following you on instagram tonight too. Can’t wait to see more!! You went from average to outstanding. The cups alternating blue and white caught my attention. Yes lightening the baskets made a big difference. The counter support looked brown in the first picture then off white. The off white looks better. Your blue is almost the one I chose for my kitchen/family room 8 years ago, I still love it, unfortunately I have not gotten very far with my modifications. Question: is that a new fridge or did you paint it? Nice tour, lots of pictures. What do you use to seal wood after adding white wash? your redesigns are absolutely gorgeous!! its amazing such HUGE transformations! gives people like me inspiration that you can get that dream result with some work and creative skills. so glad I stumbled upon your page! the kitchen is so beautiful and to see a brick wall as well?? this is like a dream kitchen to me. maybe one day I will own a house again to be able to do this, until then I can look on your page and dream! Beautiful remodel! I love your color scheme, and all the little details that are perfectly placed! Ooooh!!! Eye candy for sure. I LOVE your kitchen!! It’s the prettiest one I’ve seen so far. Not over the top fancy, but warm and so inviting. The color pop is perfect!! I also love the pickled butcher block…the only thing I didn’t like was the shiny brass frame around the canning cook book picture…does not match with the classy farm house look. 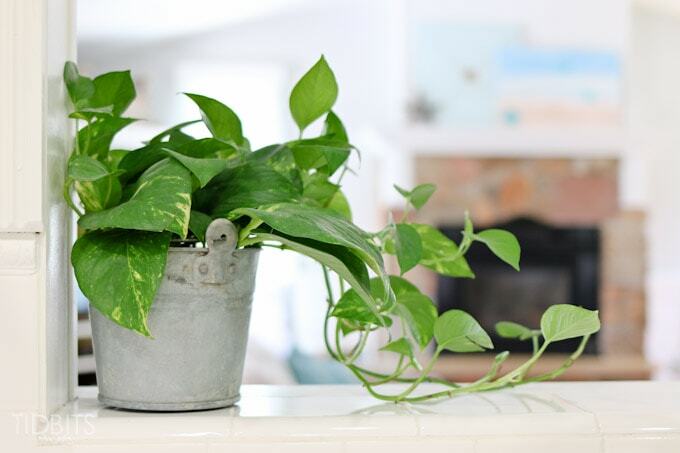 And pothos plants are super easy!! I live in south west Texas near the coast…pothos grows outside here all year…the leaves get as big as dinner plates. Huge!! Anyways, I enjoyed perusing your blog. 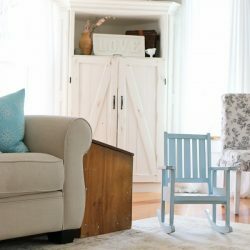 I’ll be back when I want some more inspiration…my husband and I are going to install whitewashed pine floors in our living room…that’s what brought me to your blog in the first place. What an amazing kitchen you and your husband have created. 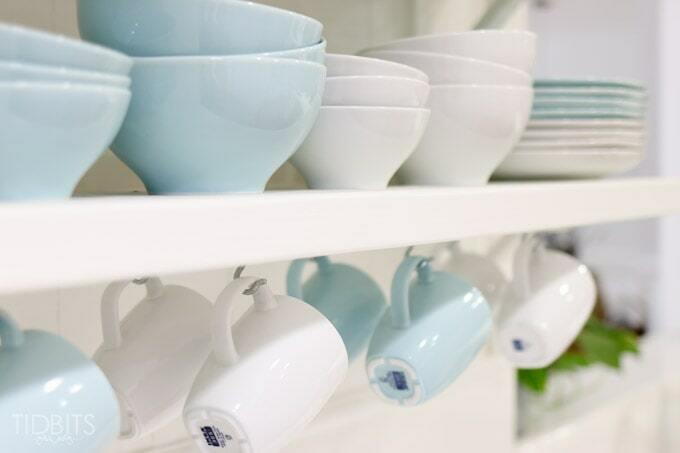 Many years ago a few houses back I painted my kitchen blue and cream in stronger colours than yours and loved it. Unfortunately we were selling at the time. I am moving in a few months to a modern Edwardian Townhouse which will contain my old antique furniture and to blend I will use many of your ideas. Most especially the scroll brackets under the bench. Regrettable there is insufficient wall space to incorporate the open shelving, and the area itself is smaller than yours. Because of the size I do not think I will incorporate black relief as you have in the handles. Thank you so much for sharing. 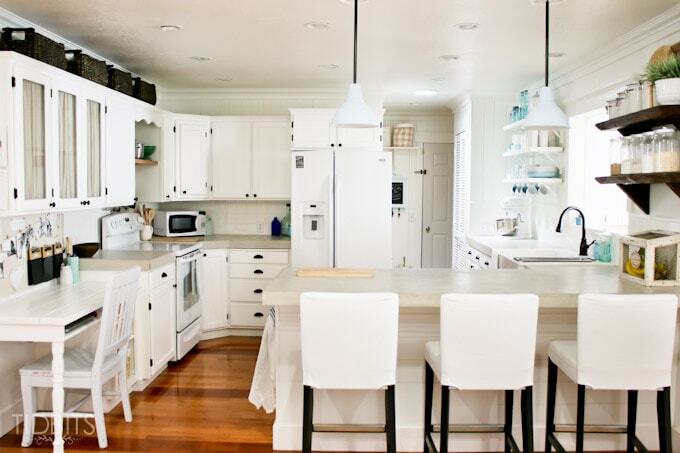 Beautiful kitchen, with white make the kitchen became more bright and clean. Fabulous job!!! Yes, white always makes things better in my opinion! 😉 Thanks for stopping by! The kitchen looks gorgeous!! I love what you did to the island!! Where did you get that towel bar at the end of the counter? Thank you so much Christine! I got it from IKEA. I believe they still have them! OMG!The wonderful kitchen I have seen ever.All in one room.I think you can used this as a dining space.The decoration is awesome. Camitidbits, I think this is a ideal kitchen model for them who really want to have not only a gorgeous but also at a time calm and peaceful kitchen. Really It looks very peaceful . I must say that there is no natural light there but the white color and all color combination make it very shiny and also I admit your choice and decoration style is admirable. Every single things is in there perfect place. Be happy whit your kitchen. Thanks for sharing such beautiful kitchen like this.